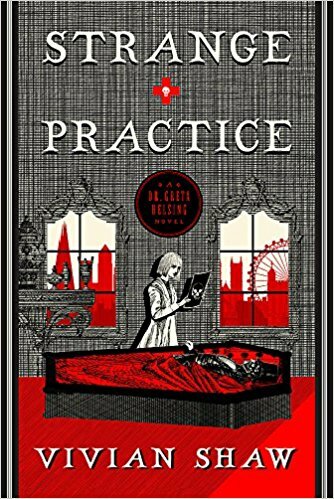 Strange Practice is about Greta Helsing, descendent of the Van Helsings and doctor to the undead, and three of her friends trying to find the person (or persons) terrorizing London. Overall, I really liked this book. It has unique characters and I’ve discovered recently that I really enjoy a book with a medical or scientific theme that is written so that the non-scientifically inclined can understand and enjoy it. However, I did have several issues with the book. Until the fourth chapter I thought the book took place in the late 1800’s; It does not – it is present day. There were a few insights to that along the way but really I feel that it should have been made more clear. The audiobook narrator, Susanna Hampton, has a wonderful voice and reads well, however it would have been nice to have a pause between changing points of view because there are several to keep track of. I think this contributed to my main issue: I had a difficult time keeping the three main male characters straight. Two vamps and a demon make Ruthven, Varney, and Fass. I ended up keeping notes on a post-it to reference each POV change. I would have also liked a bit more background on the supes, especially the difference in a vampire and a vampyre and why they can be in the sun. There were also some minor story/character issues, but overall I am intrigued enough by Dr. Helsing to look forward to reading the second book in the series.